In a world where wine bottles are merely disposable and recyclable containers of liquid, it seems surprising that they were once expensive and highly prized objects. Initially made exclusively for 'gentlemans' cellars, wine merchants and some of the better city taverns, wine bottles were dark green in colour, almost black. The aim with their colour was probably to strike a balance between protecting the contents from sunlight and being able to see the contents. 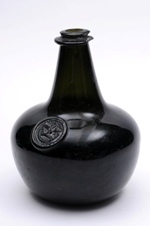 These early wine bottles had a 'kick up' or concave base (like that on a modern champagne bottle) to provide strength. They also had an applied string rim to allow corks to be tied down – this latter adaption because the bottle could not be laid on its side. The earliest verifiable mention of glass bottles in Britain was in 1632 when Sir Robert Mansell acquired the sole patent for the making of 'broade glasses, looking glasses, bottles or vessels made of glass of any fashion, stuffe, matter or metal whatsoever'. 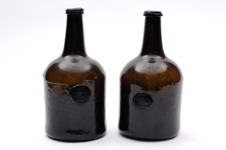 These wine bottles, although used for storage, were more readily used for transportation to the table and for the serving of wine in a similar fashion to a decanter, although Samuel Pepys did feel it worthy of record that he visited the Mitre to see his personal bottles being filled in 1663. The reference to personal bottles does indicate that wine bottles were expensive items that needed to be personalised to avoid theft. The easiest method of personalising them was to apply a seal to the shoulder or side of the wine bottle; much like a wax seal on a letter, only done so permanently in molten glass. 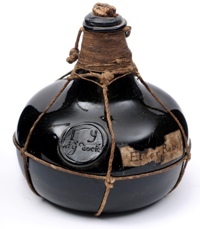 The oldest surviving glass bottle is marked John Jefferson 1652.
showing how the cork was tied down. The earliest form of antique wine bottle is referred to as being of Shaft and Globe form and was a free-blown wine bottle that resembled a balloon with a long neck. The next advance occurred during the late 17th and early 18th century and was the so called Onion bottle - a squat version of the same with a shorter neck and kick up, which was stronger. When blown into a cup-shaped wooden mould, glass blowers could make a more consistent and useful size wine bottle for cellars. The 1720-40s saw the flattening of the circular Onion wine bottle into an oval Bladder Onion bottle, something which had a smaller footprint that allowed more wine bottles to stand in a smaller area of cellar – although this was not everyone's concern as the Mallet shaped wine bottle also appeared at this point. Robt Cadbury, Welling'n dated 1775. It was circa 1750 that the first circular wine bottles appeared, which evolved slowly - first as the Squat Cylinder wine bottle and then as the so called Cylinder wine bottle (that we would recognise today) – at last a bottle that could be laid on its side! The final step in the early 19th century was to blow wine bottles into an iron three-piece mould and, therefore, produce an equally sized bottle with a verifiable volume of contents.